I'd ridden the 3 Peaks Cyclo-Cross race 5 times before, I'd had good luck, bad luck, been not so fit, and been fit. In 2013 things more or less all came together. A PB of just under 4 1/2 hours. I still ride, but mainly do long distance stuff with my son now. 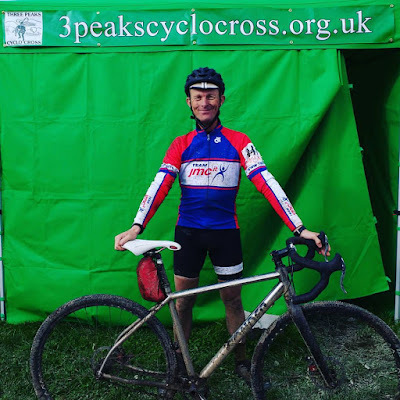 So the 3 Peaks wasn't on my radar until a friend of mine, Jon Wyatt reminded me, that he still had the fastest time round the course on a fixed wheel bike. This he does every year as entries go live. In 2006 Jon recorded a time of 4:52 on his Pompino. At the time he was the fastest on a fixed gear bike, and, it has to be said, also the only person to do it on one at that time. In 2011, I decided to have a go at relinquishing him of his record. Unfortunately for me, a couple of punctures and an exploding chain left me short of this achievement. So 2016 and the entries go live. Jon, just happens to mention as per that his ancient record is still standing. Like a fish to the hook with the bait, I bite. "Aye, go on then"
As I mentioned earlier, I do a lot of long stuff with my son these days. My training would be a 2000 mile trip round France with him in August, so even if I had no top end, I should have a bit of leg strength. As well as a bit of fitness, the other thing I would need was a bike. Alpkit kindly loaned me one of their Sonder Titanium Camino bikes, to which I added a White Industries Eccentric hub, so that there was a way of tensioning the chain. Here is the Camino 30 minutes before the start of the race. Minutes before the start and I was unusually nervous. I wasn't coming back to have a go at this again, The wrong side of 50 now, this would have to count. As the peloton flies towards the first climb, Simon Fell I stay clear of any potential trouble. Then once off road I start plodding up the hill mindful that getting to the top of Simon Fell in an hour would be a good marker. Climbing over the stile, "Rawnsley's Leap" I am bang on schedule. From the summit of Ingleborough down to Cold Cotes I make up 24 places. Remember just keep pedalling. 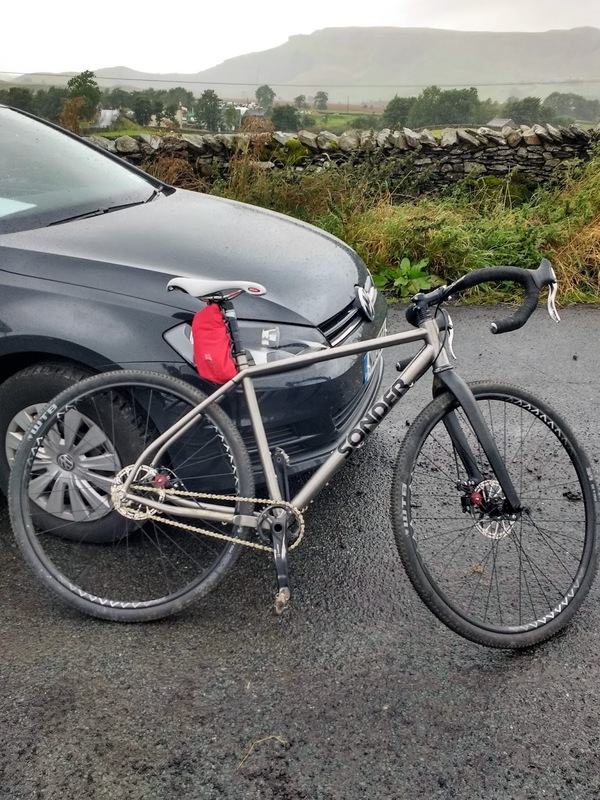 My gear choice is spot on for the road bit to Whernside, then I just have to grunt my way up the steep hill with the bike on my shoulder. I love the descent off of Whernside. 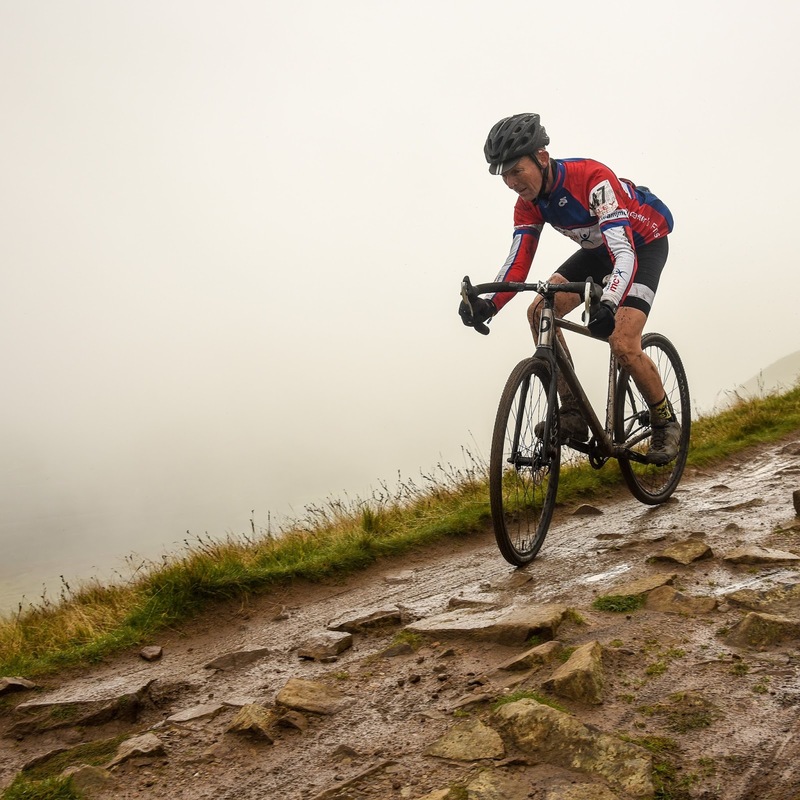 Technical and always the potential for crashing and punctures. This time I do neither. 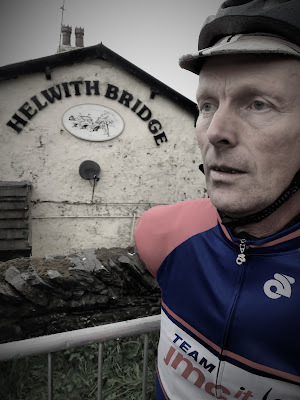 By Ribblehead I have made up another 24 places. My wife Ann gave me some Jelly Babies and a quick swig of water at Ribblehead. I had time in hand, but not enough to hang about. The road section towards Horton isn't ideal on a fixed gear, that is it never feels like the right one. I was either hauling the bars out of the saddle or spinning furiously. The maximum speed equated to the cranks turning at just over 180rpm. Pen Y Ghent lane comes soon enough, and one by one I pass the places associated with past exploding chains and punctures. I must be careful. I have time in hand, but not for any of these things. I ride and walk up the last hill of the day. Then it's a cautious descent, though I still manage to gain a few more places before the finish. Thanks to Alpkit for the loan of the Camino. Shod with tubeless 35mm tyres it was a great ride. Thanks to my wife for her pit duties and feeding me. Also, thanks to Andy Watson and Racingsnakes for the pictures.